There are so many pre-workouts on the market that it can be impossible to know where to look when you’re trying to choose one to include in your workout regimen. Do you need a pre workout with creatine, with caffeine, or with none of the above? Do you prefer to keep your workout supplements as natural as possible? If the latter is the case, we’ve collected some information for you about natural pre workout supplements to help make that decision easier. We’ll review some of the best products on the market and let you know which one is the winner, so let’s get on with the show! 1 What Are The Benefits of Natural Preworkout Supplements? 2 Why do People Prefer Natural Preworkout Supplements? 3 What Ingredients Should You be Looking For in a Natural Preworkout Supplements? 4 When is the Best Time to Take Your Pre workout? What Are The Benefits of Natural Preworkout Supplements? Pre workout supplements are designed to help give you some extra energy and pump to let you get the best results from every single workout. They’re made up of a host of different ingredients like citrulline, creatine, and other amino acids that we’ll discuss in more detail in just a moment. Like other pre workouts, natural pre workouts have one purpose — getting you pumped up and ready for your workout. These natural supplements do just that without all the extra ingredients. Why do People Prefer Natural Preworkout Supplements? The biggest reason people prefer natural pre workout supplements when compared to other pre workouts on the market is that their ingredients are all natural. This is especially important if you are either sensitive to any artificial ingredients like preservatives or artificial sweeteners. If you are trying to keep your diet as clean as possible but still want to have that extra little push to get you through your workouts, a natural pre workout will likely be your best option. What Ingredients Should You be Looking For in a Natural Preworkout Supplements? Whether they choose to use natural ingredients or not, pre workout supplements are made up of the same basic core ingredients. Citrulline — Citrulline is an amino acid that is added to pre workout supplements because it helps the body produce more nitric oxide. Nitric oxide helps to improve endurance by dilating the blood vessels throughout the body, increasing blood flow and improving overall circulation.It’s an ideal supplement for runners, cyclists, or other athletes that need high levels of endurance. It can be a good addition for individuals who focus more on strength training than endurance as well, simply because your muscles benefit from the increased blood flow during strength training as well. Creatine — Creatine is a common supplement that appears in many different supplements and can be used during both before and after your workout. It’s the most frequently studied supplement and has been found to be beneficial for building muscle and strength training. It’s been shown to increase muscle growth when taken before your workout, after your workout, or both. Caffeine — Caffeine is a common stimulant that shows up in everything from coffee to chocolate, and also is used in many pre workout supplements. Caffeine is an effective fat burner, which is why your favorite gym probably offers free coffee too. B Vitamins — B vitamins are great for a natural energy boost. These vitamins help to promote higher overall energy levels, especially if you have a natural vitamin deficiency. Note — we’re not medical professionals, so if you’re concerned about a vitamin deficiency, talk to your doctor! Taurine — you’ve probably seen Taurine on the label of your favorite energy drink. It is considered an endurance booster, which is useful if you need a bit of extra help making it through your workout. Beta-Alanine — this is an amino acid that is already produced by your body. It triggers the production of a chemical called carnosine. It’s a multi-step process but carnosine helps to reduce muscle fatigue which makes it easier to make it through your workout. Betatine — Betatine is naturally found in beets and other root vegetables. It’s marketed as an endurance booster, though it is a fairly new supplement and hasn’t been studied as extensively as some of the other supplements that you might encounter. The rest of the ingredients you’ll find in your natural pre workout are considered ‘inactive ingredients’ — sweeteners, flavoring, and other ingredients that aren’t as important as the active ingredients. It is also important to note that many pre workouts rely on proprietary ingredient blends. While they may contain the same ingredients as supplements that don’t rely on those blends, you don’t know the exact amounts of each ingredient — instead, you’ll see a blend with a list of ingredients and a total amount per serving included in the nutrition facts. If you’re looking for a high or low amount of a specific ingredient, you’re out of luck — you just have to trust that all the ingredients are in there and in safe amounts. Plenty of brands do use these proprietary blends, but it’s a good idea to avoid them if you can, especially if you’re new to the world of natural pre workouts. When is the Best Time to Take Your Pre workout? It’s always a better idea to read the specific directions on your natural pre workout, but in general, you’re going to want to mix up and drink your pre workout between 15 and 30 minutes before you start working out. If you’ve got a short drive to the gym, feel free to mix it up before you leave so you’re ready to go when you get there, but make sure you judge the drive carefully and make sure that you don’t hit any traffic that might delay your arrival. And now, for what you’ve all been waiting for — the reviews of some of the best natural pre workouts on the market. Which pre workouts will work the best for you, and what are their pros and cons? Read on for our review of each of the 5 products listed above, and don’t forget to stick around to see who the winner of the best natural pre workout is. 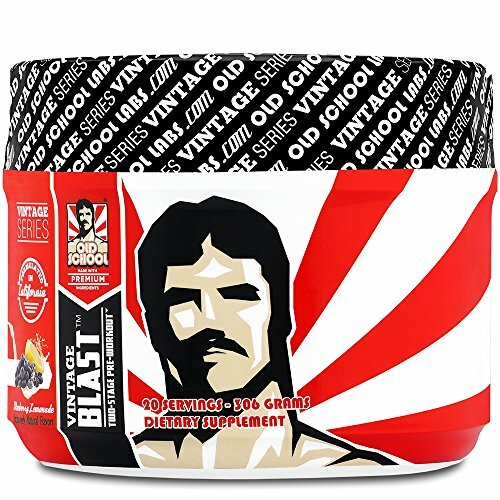 Vintage Blast comes from one of the most well-known brands of workout supplements, and Blast is a fantastic tool for anyone looking for an all natural pre-workout that provides real results. Blast is a two stage pre workout that helps sustain you throughout your entire workout. Stage 1 is formulated to produce energy and improve endurance, with ingredients like caffeine, D-Aspartic Acid, and N-Acetyl Tyrosine. Stage 2 improves focus and athletic performance, relying on components like Citrulline and Arginine. It keeps you going throughout the workout without a big crash when it wears off. It can easily be used by both men and women and works well for both strength and endurance training. The formula relies on Citrulline instead of creatine, making it suitable for all forms of training. No Proprietary Blend — All of Vintage Blast’s ingredients are clearly outlined on the label as part of the nutrition facts. Stevia — Blast uses stevia as a sweetener instead of artificial alternatives like sucralose or calorie-heavy sweeteners like sugar, honey, or corn syrup. Designed for Balance — Blast isn’t just for boosts. It also contains electrolytes and micronutrients to help you keep your body in balance. Caffeine — while the caffeine does come from a natural source, it might not be suitable for individuals sensitive to the stimulant. Not Recommended for Evening Workouts — the pre workout’s formula and the inclusion of caffeine could interfere with sleep if taken late in the day. 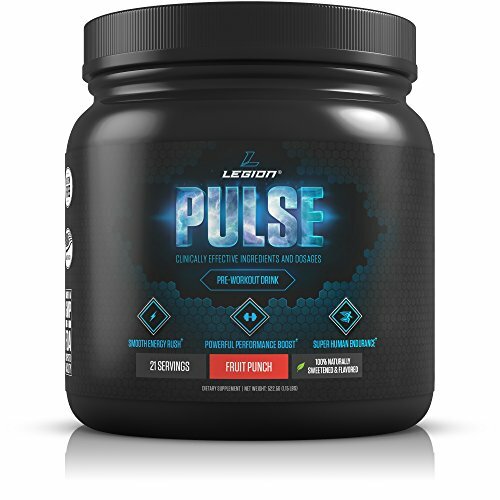 If you’re a fan of natural pre workouts, than look no further than Legion Pulse. This citrulline based pre workout is designed and balanced to create the most efficient pre workout without a host of side effects. It also includes ingredients like beta-alanine and Betaine, which we spoke about earlier, as well as just enough caffeine to get you started. In addition to those ingredients, it also includes ornithine, which is thought to improve fat burning and reduce overall fatigue, and theanine, which is found in tea and works well with caffeine to improve focus and mood. The citrulline and theanine both work as nitric oxide boosters to improve blood circulation and improve endurance. Pulse comes in 5 flavors — blue raspberry, fruit punch, grape, green apple, and watermelon. No Proprietary Blend — all of the ingredients and their amounts are clearly outlined on the nutrition facts label. Natural Sweeteners — Pulse uses stevia and erythritol to sweeten this natural pre workout. No Artificial Colors/Flavors — No artificial additives are used in this pre workout. High Caffeine Levels — This pre workout contains 350mg of caffeine. When paired with other ingredients, can cause jitters, racing heart, and a crash after the pre workout wears off. Creatine Free — Ideal for both strength trainers and endurance trainers. Many pre workouts contain animal products such as whey, making them less than an idea for individuals who prefer a vegan diet. 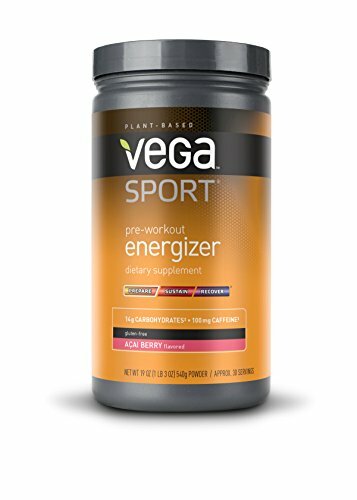 Vega Sport is an all natural and completely vegan pre workout. It also has some of a unique ingredients that we’ve ever come across in a pre workout. It relies on ingredients like brown rice syrup and coconut palm nectar for sustained natural energy that is low on the glycemic index. It also includes two different types of tea — green and yerba mate — which add caffeine as well as theanine for focus. Additionally, it also contains ginseng which is thought to increase physical capacity and rhodolia which is a common herbal treatment for stress, fatigue, and weakness. It doesn’t generate the crazy energy boost that you might be used to when taking other pre workouts, but it does create a reservoir of sustained energy to carry you through your workouts without leaving you totally spent afterward. Vegan — This pre workout contains no animal products, including honey. Gluten Free — In spite of its natural ingredients, this pre workout is completely gluten-free, making it ideal for gluten sensitive individuals. No Crash — Low levels of natural caffeine provide energy without crashing afterward. Flavor — like many foods that are good for you, the flavor leaves a lot to be desired. Does Not Dissolve Well — it takes a vigorous shaking in a shaker cup or a spin through the blender to get all of the clumps to dissolve completely. 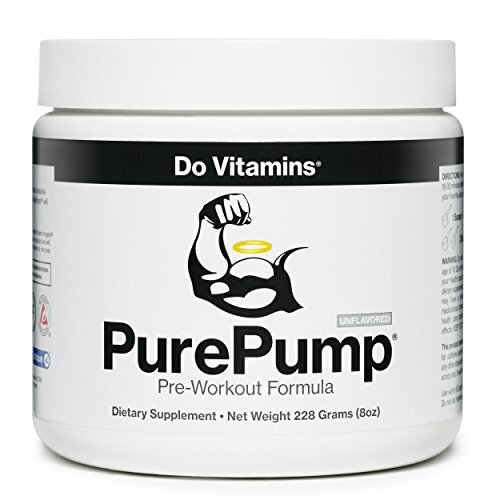 If you’re looking for a pre workout that does the job without all the bells and whistles, Pure Pump by Do Vitamins should be on your list. This supplement contains both creatine and citrulline, making it ideal for anyone who’s doing strength training. It’s lower on the caffeine end of the spectrum, with each serving containing the only 200mg of caffeine from the green tea in the formula — it’s enough to get you going but not enough to send you through the roof. What makes Pure Pump really unique is that it’s an unflavored powder. Instead of trying to find the best natural flavors and sweeteners, Do Vitamins just opted to skip the flavors altogether. You can mix it with water, juice, breakfast — whatever floats your boat. For someone trying to keep their diet clean, this is easily one of the best natural pre workouts on the market. Good for Everyone — This pre workout is certified vegan, paleo, and keto, making it the ideal choice for a variety of different individuals. No Artificial Anything — No artificial flavors, colors, sweeteners, or fillings are included in this unflavored pre workout. Lower Caffeine — this particular pre workout only has 200mg of caffeine per serving, much lower than some of the other ones that we have reviewed. Flavor — this unflavored drink might not agree with everyone’s taste buds. 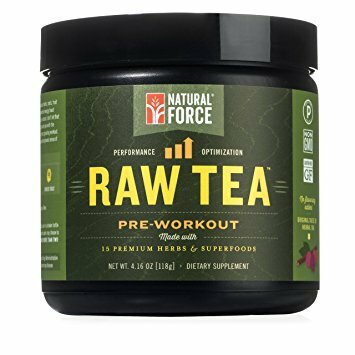 If you’re looking to get a meal along with your pre workout, Raw Tea is the way to go. This pre workout doesn’t just include the caffeine and amino acids that you need to keep you going throughout your workout — it also includes a variety of different herbs and ‘super foods’ to help sustain your body long after your workout is over. It’s difficult to tell what pre workout related ingredients are actually in this pre workout. It may contain Betaine, due to the beetroot powder, but beyond that, the ingredients don’t tell you much. It contains ingredients like bee pollen, royal jelly extract (another product of bee hives), ginseng root extract, and hawthorn leaf and flower extract. The caffeine provided by the green tea in the formula does give you a bit of an energy boost, but beyond that — whether or not this pre workout works for you is entirely up to your body chemistry. No Artificial Colors/Sweeteners — this pre workout relies on the natural ingredients to flavor and color their product. Utilizes a proprietary blend — it’s difficult to determine the ratio of ingredients on the nutrition facts label due to the proprietary blends utilized by this company. No Pre workout Ingredients — based on the labels and information provided, this pre workout doesn’t actually contain any of the ingredients that you normally look for in a pre workout like creatine, citrulline, or beta-alanine. After looking at all the products that we’ve reviewed, who comes out on top? What natural pre workout is the best for anyone looking for a product to boost their workout? After reviewing the products that we listed above, the conclusion is clear — Do Vitamins Pure Pump is the winner of best natural pre workout. It provides a powerful pump without too much caffeine, and while it is unflavored, that small flaw can easily be remedied by simply mixing it with your favorite juice or drink. Pure Pump is a good choice for anyone looking to add a little bit of boost to their workout without overdoing it with the stimulants. It works ideally for both men and women, and for those reasons, it is the clear winner today.